Home / Mission Furniture Collection / Arts and Crafts Nightstand Woodworking Plan. 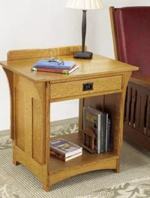 31-MD-00433 - Arts and Crafts Nightstand Woodworking Plan. Made to complement our heirloom-quality Arts and Crafts bed, this solid-oak nightstand features matching corbels and arched rails in addition to ample drawer and open storage. This project can also serve as an end table, either way you will find the project well-suited for any home. Other plans in this collection sold separately include: the Arts and Crafts Blanket Chest 31-MD-00446, the Arts and Crafts Bed 31-MD-00424, Arts and Crafts Dresser 31-MD-00440, and the Mission Mirror 31-MD-00437. We used oak, but you can use a wood of your choice. A full materials and supplies list is included with the plan. Tablesaw, drill press, clamps, bandsaw, table mounted router, common hand tools. Great service and responce time.